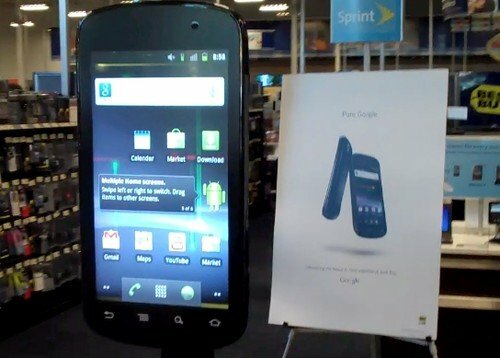 As part of Best Buy's strategy for marketing the Nexus S, giant six-foot fully-functional models of the device have been set up in stores across the country. Now we'll seen giant promotional phones, but this is the first time I've come across one that actually works. One curious broseph popped into his local Best Buy to repair his broken Nexus S and had the genius idea of rooting the larger than life Nexus S. Check out the video after the break. Slipping under the radar of the store's managers and workers, this dude managed to actually root the huge six-foot device without anyone noticing. To prove his point, he shot this YouTube video displaying the rooted behemoth in action. He must have left the store in a hurry, but I bet the guys over at Best Buy weren't too happy to see their marketing gimmick get rooted. For all we know, this guy from Anywhere USA could've voided the warranty on the device. Hopefully no one gets fired, but the real question is: can I get my hands on this gianst Nexus S on eBay? I desperately want to have one in my living room now. I had absolutely no idea that those huge prototypes were real. Crazy! Ugh I had to stop watching when I heard his "bro-tastic" voice.